Iowa free safety Brandon Snyder was arrested by Iowa City police early Sunday morning and charged with drunken driving following a traffic stop near Kinnick Stadium. According to police reports, an off-duty dispatcher called police around 3:04 a.m. to report a vehicle being driven recklessly. An officer located Snyder driving a 2017 Dodge Challenger near the intersection of Melrose Avenue and Hawkins Drive. The vehicle was pulled over and reports indicate that Snyder displayed multiple signs of intoxication, including impaired speech and an odor of alcohol. The report indicates that Snyder, 22, admitted to drinking, was wearing multiple bar wristbands and showed what was described as “measurable impairment’’ on field sobriety tests. A breath test measured Snyder’s blood alcohol content at .163, more than twice the legal limit to operate a motor vehicle under Iowa statute. The junior who played in one game this season for the Hawkeyes and has undergone surgery twice this year to repair a torn anterior cruciate ligament in his left leg was charged with operating while intoxicated. Coach Kirk Ferentz issued a statement Sunday indicating that he was aware of the incident. A member of the Iowa football team’s leadership group for the 2017 season, Snyder arrived at Iowa as a walk-on and earned a scholarship, recording 85 tackles and three interceptions in 2016 as a first-year starter in the Hawkeye secondary. He initially tore the ligament in his left leg early in spring practices, but returned to competition earlier than expected for an Oct. 7 game against Illinois when he recorded three tackles, returned an interception 89 yards for a touchdown and broke up two additional passes. Snyder also re-injured his knee in the game, requiring an additional surgery. Ferentz indicated in November that Snyder is not expected to return to the field for Iowa until June. The Berkeley County Sheriff’s Office and Highway Patrol were involved Friday in a high-speed chase that started at a DUI checkpoint along Highway 52 in Goose Creek. The incident happened around 11:10 p.m. Friday..
ABC News 4’s Megan Rivers witnessed a Dodge Challenger slam into a tree as it came down Highway 52 toward I-26 fleeing police. The Challenger also hit a car, Rivers said. No other official details have been released regarding the incident. A Texas DPS trooper, along with other law enforcement, was involved in a high-speed chase earlier today in Lynn, Lubbock and Hale counties. The trooper stopped a 2015 Dodge Challenger on US 87 in Lynn County around 11:40 this morning (Jan. 17). The vehicle then sped off after the trooper exited his vehicle. The Dodge Challenger was then spotted by a Lubbock County Sheriff’s Deputy on MLK and the chase resumed again. The suspect then led authorities onto East Loop 289 and then I-27 traveling northbound. The suspect’s vehicle was then successfully intercepted on I-27 in Hale County, near Plainview. DPS used spikes to deflate the Challenger’s tires. The driver of the vehicle was immediately arrested and identified as 28 year-old Chez Eugene Weaver of Lubbock. He was wanted on a parole violation for burglary and additional charges are pending. A Hattiesburg man is behind bars after stealing a grey 2018 Dodge Challenger from Beach Boulevard. Biloxi police arrested 35-year-old Terry Graham for the felony taking of a motor vehicle. According to officials, the victim reported his Challenger stolen from the 800 block of Beach Boulevard and officers quickly notified agencies of the theft. D’Iberville police attempted to make contact with the vehicle, which fled westbound on I-10. Graham then lost control of the vehicle near Cedar Lake Road and then fled the scene on foot and was taken into custody with the assistance of a police k-9. His bond is set at $50,000. This one happened 5 minutes from my house. It doesn't mention it in the article, but there was a blue Hellcat involved. See the second photo. RICHMOND (CBS SF) — Two suspects have been arrested after the pursuit of a Dodge Challenger involved in a Richmond carjacking ended with the vehicle crashing into the garage of a vacant home, authorities said. Richmond police said one of its officers was patrolling a Iron Triangle neighborhood when he saw a distinct car – a Dodge Challenger with a black stripe on the side and stripes on top. The officer remembered an armed carjacking incident a few day before that involved that same car. The officer called for back-up and when the other officers arrived attempted a traffic stop. When the officers were giving orders to the occupants, the driver of the carjacked Challenger stepped on the accelerator and took off. The officers got back into their patrol cars and started a pursuit. The Challenger had a head start and the officers couldn’t catch up. But Challenger driver lost control and crashed into a garage. When the officers arrived at the crash scene, they began a search aided by tracking dogs. Both suspects were discovered hiding and arrested. No one in the car or home were injured. DACULA, GA — The Gwinnett County Police Department needs the public's help in identifying a man who suddenly snatched several pizzas from another man Feb. 10 at Riverside Pizza, located at 505 Dacula Road, in Dacula. A man left the store with 10 pizzas and was approached by another man who suddenly snatched multiple pizzas from him, according to police. The robber ran back to a white car and left the parking lot on Dacula Road towards Hurricane Shoals Road. The robber's vehicle is a White Dodge Challenger with a distinctive set of rims. The robber was described as a black man wearing a gray zip up hoodie and blue jeans. Police in Tokyo have finally arrested a man who was allegedly spotted driving 145 mph his Dodge Challenger on an expressway—and flipping off the speed cameras that recorded his impromptu Mid Night Club audition—after a two-year search, The Asahi Shimbun reports. On the night of January 29, 2016, authorities say forty-one-year-old Yoshimune Shirai piloted his muscle car onto the Chuo Expressway and accelerated to nearly 150 mph. The fateful run was tracked by Tokyo's Orbis speed camera system, which captured an image of the Challenger flying down the road with the driver's middle finger raised proudly in the air. Shirai was arrested on Thursday. It took more than two years to track him down in part because the Challenger was missing its front license plate. However, the region's extensive network of speed cameras eventually captured five more images of the car speeding in various locations, and police were able to piece together a positive identification...of the car, that is. So far, Shirai has reportedly proclaimed his innocence, telling investigators that there's no proof that he was the one behind the wheel at the time. CLARKSBURG — The Harrison County Sheriff’s Department is looking for a car involved in a high speed pursuit on Thursday afternoon. 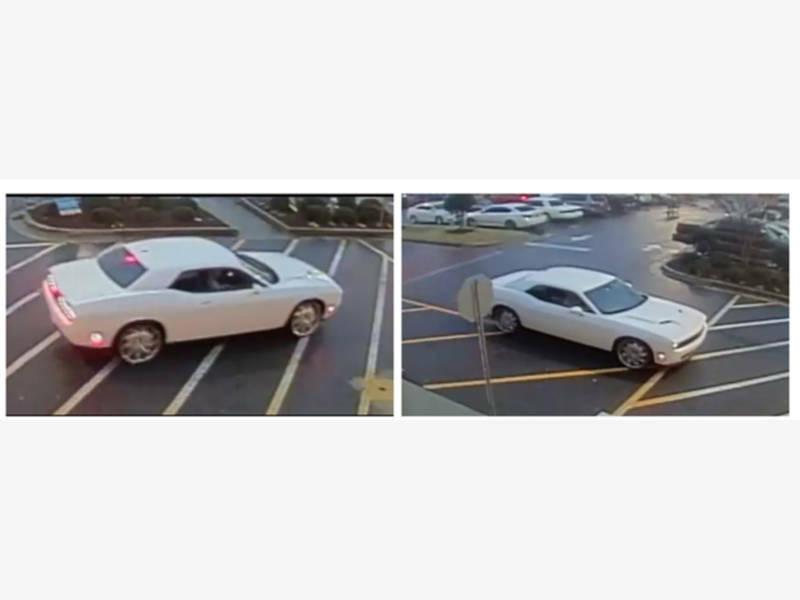 Sheriff Robert Matheny said police are looking for any information on the owner of a dark gray, newer model Dodge Challenger with a temporary license plate. A deputy had the car on U.S. 50 east near Wilsonburg reaching an excess of 100 mph on radar, Matheny said. Matheny said the deputy backed off and state police got involved to maintain visual contact into Lewis County. Anyone with information is asked to call the Harrison County Sheriff’s Department at 304-623-6655 or submit a tip of West Virginia Crime Stoppers. Bosco the dog was locked in the bed of a pickup truck for two days and on Thursday, Bosco’s owner was locked up in the Florida Keys jail. David Varie, 39, was arrested on a misdemeanor charge of abandoning an animal after Bosco, a male black-lab mix estimated to be 2 or 3 years old, was found in the back of Varie’s Dodge Ram 1500, which was parked and not running at the Marathon Publix around 12:55 p.m.
Monroe County Sheriff’s Office Deputy Michael Maleta wrote in his arrest report that a manager at Publix reported getting to work at 6 a.m. and seeing the parked truck. When he took a lunch break around 11:45, the truck was still there and he saw Bosco in the bed of the truck. That’s when he called the Sheriff’s Office. SPCA staffer Hugh Smith used a digital thermometer to measure the temperature in the truck bed and cab and “the temperature of the truck bed ranged from 87 degrees to 102 degrees. The temperature of the cab ranged from 108 degrees to 109 degrees,” the deputy wrote. Friday, Varie, who also is charged with pot possession because he had a joint when arrested, remained in the county jail on $3,000 bond. Monroe County Sheriff’s Office deputies arrested a Homestead man after a reported road rage incident where he’s accused of slapping another motorist in the face and having two unlicensed firearms, including a loaded miniature AK-47 rifle, within arm’s reach in his car. Tyrell Demming, 22, was booked on a felony charge of carrying concealed unlicensed firearms, and a misdemeanor battery charge. He was booked into Plantation Key jail on $30,000 bond Friday morning. The other driver, Carlos Rodriguez, also of Homestead, told police that Demming used his purple Dodge Challenger to block Rodriguez’s vehicle from behind in a parking space at the Tom Thumb gas station at mile marker 98, around 7:30 a.m. Friday. Demming honked the horn and yelled obscenities, Rodriguez said. Demming then walked to the driver’s side of Rodriguez’s vehicle, pulled up his shirt to display a pistol in his waistband and then slapped Rodriguez in the face, the victim related to deputies. Demming left but was stopped by a deputy at the Chevron at mile marker 92. He told Lt. Corey Bryan that Rodriguez would not let him merge into southbound traffic near mile marker 99 and almost ran him off the road and into a tree. According to the arrest report, Demming told Bryan that he did confront Rodriguez in the Tom Thumb parking lot. Demming claimed Rodriguez was the one who started the confrontation by taking off his shirt and running toward the Challenger. He denied ever showing Rodriguez a gun. Demming said he slapped Rodriguez, but only after Rodriguez “jumped” at him, according to Deputy Benjamin Elmore’s report. “The camera angle doesn’t show the entire altercation and the firearm can’t be seen in the video,” Benjamin wrote in his report. The other gun found in Demming’s car was a Smith & Wesson .40 caliber pistol, which has a black polymer frame similar to a Glock, which is what Rodriguez told deputies Demming displayed during the altercation. The Draco AK-47 was loaded with a 30-round magazine. Demming told deputies he carries the guns in his car “because he travels a lot,” Benjamin wrote. Demming does not have a concealed weapons permit, and both weapons were kept in duffel bags in the car, according to Benjamin’s report. Two Brownwood residents face criminal charges after a search turned up more than three kilograms of THC-infused edibles in their vehicle on March 15. The driver of the vehicle, Tyler Deltroro, 18, and the passenger, Victor Rodriguez, 19, were both charged with possession of a controlled substance PG 2 greater than or equal to 400 grams. Texas Department of Public Safety Sgt. Sara Warren stated at about 10:31 p.m. a trooper stopped a 2013 Dodge Challenger on Interstate Highway-35E two miles north of Milford for a traffic violation. According to the Drug Enforcement Administration website, edibles are food products infused with marijuana. The effects of smoking marijuana only take minutes. Edibles take between 1-3 hours because the food is absorbed into the bloodstream through the liver. The DEA website notes that, among 12th graders who have used marijuana in the past year, 40 percent reported having consumed it in edible form in medical marijuana states, versus 26 percent in non-medical marijuana states. Deltoro and Rodriguez were taken into custody and booked into the Wayne McCollum Detention Center in Waxahachie. Rodriguez was also charged with possession of a controlled substance PG 1 less than one gram, possession of marijuana less than two ounces, and unlawful carrying of a weapon. Deltoro is facing charges of possession of marijuana less than two ounces, and unlawful caring of a weapon. Records from the detention center show Rodriguez had bonds totaling $37,500 and Deltoro had bonds totaling $32,500. The detention center website shows Rodriguez and Deltoro no longer listed as an inmate in the facility. You think they will showup? DEKALB COUNTY, Ga. - Police are investigating a drive-by shooting that left a 3-year-old dead in DeKalb County, Georgia late Sunday night. According to Atlanta's WSB-TV, a woman was driving when another vehicle pulled up alongside her and someone inside fired a shot into the rear passenger door. Her child was strapped into the rear passenger seat. “She saw somebody who was pointing what appeared to be a paintball gun at her vehicle and she heard a real gunshot,” DeKalb County Police Chief James Conroy said. Police said the incident happened on Eastland Road late Sunday near southeast Atlanta. The child’s mother, Rashonda Craig, told WSB-TV that the situation was like a nightmare. She said she was driving on Bouldercrest Road in southeast Atlanta around 11:30 p.m. Sunday when she saw someone pull up in a gray Dodge Charger and point what she thought to be a paintball gun at her vehicle. Less than a mile up the road, she said she realized he was hit. Craig said her son just turned 3 a few days ago and that she has no idea who would do this to him. She thinks it might have been a case of mistaken identity because she was driving a rental car. Police said they are looking for a gray Dodge Charger with a temporary tag. A Wednesday night crash landed a woman in jail after she tried to drive away from the scene. Monroe County Sheriff’s Office Cpl. Brian Millsaps said it was around 8:30 p.m. when he arrived at the intersection of Thompson Road and Watson Chapel Road and found a Dodge Challenger had hit a power pole before coming to rest in a field. Millsaps said the driver, Sarah Danielle Martinez, 29, Hale Circle, Madisonville, was still sitting in the car with EMS attempting to treat her. Martinez refused the treatment, and Millsaps said he tried to talk to her, but she was trying to start the car despite the damage to it. Millsaps said he eventually asked Martinez to get out of the car and she did, with help, but seemed to have trouble focusing on her surroundings. The officer also noticed that the tag on the car had expired in 2017. Millsaps said Martinez could not produce any of the car-related paperwork he asked for, but he did see an empty can of alcohol in the car. When asked, Martinez allegedly said she had drunk alcohol a couple of hours ago. Millsaps tried to have Martinez take a few sobriety tests, but despite another deputy holding her up, she was unable to do any of them. Millsaps then stopped the tests, afraid Martinez would hurt herself. Martinez was arrested and charged with DUI and seven traffic violations. Millsaps said she also later refused a blood/alcohol test. Challenger without a front license plate was stopped near the 136 mile post on I-30 by a DPS Trooper Sunday afternoon. During the stop, Ronnelle Louis Collins, 19, of Little Rock, Arkansas was deceptive when asked questions about prior criminal activity and avoided eye contact when asked questions about the presence of drugs, weapons and money in the vehicle, according to the officer’s report. A DPS K-9 unit was called. As a result of the k-9 giving a positive alert on the vehicle, a search of the vehicle found a small amount of a controlled substance, a Glock .45 caliber semi-auto handgun, $13,000, and drug paraphernalia including bags and scales. Collins is in Hopkins County Jail charged with Possession of a Controlled Substance Penalty Group 1 less than 1-gram, Money Laundering more than $2,500 but less than $30,000, and Unlawful Carrying of a Weapon. Christian D. Haines, 20, of Henrietta, was charged on March 29 with felony delivery of a controlled substance, along with three misdemeanor charges. According to a probable-cause statement filed by Deputy Scott Robeson of the Ray County Sheriff’s Department, Haines admitted to having marijuana in a bag in the trunk of his car. Haines was arrested after an off-duty deputy saw him around 3 p.m. on March 12, driving a yellow Dodge Challenger at speeds of more than 100 mph and weaving in and out of traffic, northbound on Highway 13. Haines made a left-hand turn onto westbound South Street near the Richmond High School parking lot, where Robeson stopped him. ROCHESTER, Ind. – An Indianapolis woman who’d been drinking was going nearly twice the speed limit with her child inside the car when a state trooper pulled her over in northern Indiana Monday, police say. According to Indiana State Police, a state trooper initiated a traffic stop on U.S. 31 near Fulton County Road around 2 p.m. Monday. The trooper pulled over a 2017 Dodge Challenger that was going 116 mph in a 60 mph zone, Fox 59 reported. The trooper noticed a 1-year-old child was improperly restrained in a child safety seat and saw an open alcoholic beverage in the car. Police said the driver, identified as 36-year-old Rachel Harding of Indianapolis, had a blood alcohol concentration above .08 percent, which is the legal limit to drive in Indiana. She was arrested on multiple charges, including operating a vehicle while intoxicated, criminal recklessness with a vehicle and neglect of a dependent. She was taken to the Fulton County Jail. The child was released into the care of the Fulton County Division of the Indiana Department of Child Services, police said. CLEVELAND, Ohio -- A 15-year-old girl told Cleveland police that kidnappers took her from a West Side home at gunpoint Tuesday morning. The panic forced a lock down at two nearby Parma schools. Police received a call about 8 a.m. after the girl told crossing guards near Parma Senior High School and Constellation Schools on West 54th Street that she had been kidnapped from a Cleveland home. Investigators were told that a man who was believed to be armed ran away from the scene when the girl approached the guards, Parma police Sgt. Dan Ciryak said. The girl told police that someone kidnapped her in Cleveland sometime prior to 6:40 a.m. Tuesday after spending the night at the West 38th Street home of her 20-year-old friend, according to a Cleveland police report. A woman and three men with guns entered the home and demanded money, the report says. The girl said she awoke to find one man holding a gun to her forehead and reaching into her pockets in search of cash, the report says. The girl said her friend's brother managed to run out of the home. The group forced the girl's friend outside, but he too ran away, the report says. The woman forced the girl into a Dodge Charger and the three men got into the girl's Dodge Challenger, the report says. Both cars went to a Fulton Road home where the girl said she was forced to get into her Challenger as one of the men drove it, the report says. The pair headed to a gas station and the man threatened to kill her if she yelled or screamed while they were inside, the report says. The girl said she unsuccessfully tried to get an employee's attention. The girl told the man after leaving the gas station that she was hungry. He took her to McDonald's in Brooklyn where the man tried to sell cocaine to the employee at the drive-thru window, the report says. The girl said the man drove her around before traveling into Parma. He made sexual comments, but did not touch her, the report says. The girl eventually saw the crossing guards, put the vehicle in park, and yelled "Help, I have been kidnapped," the report says. The man got out of the car and ran away. Police haven't said if they've tracked him down. Cleveland officers later checked the West 38th Street home of the girl's friend. They said the door was off its hinges and appeared as if it had been kicked in, the report says. Neither the friend nor his brother reported the incident to police. The girl said she believed her friend knew the woman who initially kidnapped her because she had seen the woman's car before, the report says. Two hundred dollars and an iPhone were stolen during the incident, but the report does not say to whom the items belonged. The girl did not require any medical attention, and no charges have been filed in the case, court and police records show. The two Parma schools were placed on a soft lock down Tuesday as police investigated the report of a possible armed man in the area. The lock down was lifted by 10 a.m., a spokesman said. HARNETT COUNTY, N.C. — Authorities are searching for the man responsible for an armed robbery at a Verizon store Tuesday morning. The Harnett County Sheriff’s Office said the man entered the store on Highway 87 just before 10 a.m. and demanded cell phones while pointing a gun at store clerks. The man took several phone before fleeing toward Spring Lake in a dark-colored, two door Dodge Challenger. MEMPHIS, Tenn. - An accident involving a horse drawn carriage led to shots being fired in downtown Memphis. A man is wanted, and a police investigation is underway after a Saturday night incident on Front Street near Pontotoc. The victim told police she was operating her horse carriage in heavy traffic when the animal got spooked and struck two vehicles. A man in a gray Dodge Challenger got out and fired “approximately three shots,” according to a police report. A witness, who was working a security job nearby, told police the suspect fired “approximately six shots” in the air. She also filmed some of the incident. Police watched the video and saw the man fire at least one shot in the air, according to the incident report. Officers found a spent 9mm shell casing in the road. Ohio State Highway Patrol troopers arrested a Georgia woman last week after finding more than 800 grams of marijuana edibles worth over $4000 during a traffic stop in Cuyahoga County. On May 18, troopers pulled over a Dodge Challenger with Georgia registration for what appeared to be a routine traffic stop for speeding on I-71. However, once they got close to the driver, 38-year-old Cashmere Coleman of Atlanta, the troopers detected an odor of marijuana. Utilizing a probable cause search, the troopers found 839 grams of marijuana edibles with a value of $4,195. They also found a loaded .22 caliber handgun. Coleman has been charged with possession and trafficking in marijuana, a fourth-degree felony and weapons under disability, a third-degree felony. Florida Highway Patrol troopers found several pounds of drugs in a car after a driver took off from troopers and crashed at a Bradenton intersection Monday. Dashon McCray, 26, of Bradenton, was driving a 2012 Dodge Challenger north on U.S. 41 approaching 30th Avenue East around 10:48 p.m. Monday when an FHP trooper driving behind McCray saw him make an improper lane change, nearly sideswiping another vehicle, according to an FHP report. The trooper turned on his cruiser's lights and sirens to initiate a traffic stop but McCray did not stop. The Challenger instead turned down a side street, then southbound onto Fifth Street East. The trooper disengaged from trying to stop the vehicle. According to the FHP report, McCray also drove through a stop sign at the intersection of 30th Avenue East and Fifth Street East, causing the Challenger to hit the right side of a 2012 Honda Odyssey. The Challenger overturned and also hit a home in the northeast corner of the intersection. McCray and the Bradenton woman driving the Odyssey suffered minor injuries and were taken to Manatee Memorial Hospital. The resident of the home was not injured, according to FHP. Investigators searched the Challenger that McCray was driving and found more than 12 pounds of marijuana and more than $10,000 in cash inside. McCray was arrested and charged with fleeing and eluding, driving with a suspended license, possession of marijuana 20 grams or more, possession of marijuana with intent to sell, improper lane change and disregarding a stop sign. Jail records show he is being held on a $6,000 bond.